We’re ready to perform a thorough evaluation of your condition and create a customised plan with you to improve your health. Then, our team of chiropractors will thoroughly review your findings to determine the best way to start your journey to health. This visit takes a total of 45 minutes including time for paperwork. You can wear your regular clothes to the appointment. Your report of findings visit is an essential visit which establishes how we may be able to help you, and what the plan of action might be. 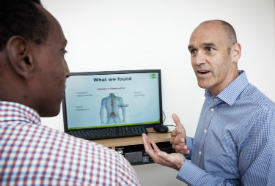 Your chiropractor will present to you your report which will include any x-ray findings, scans results and lifestyle factors that have led you to where you are now. Should you be ready to take action we start with your first chiropractic adjustment at this visit. We’ll take time to talk you through the treatment plan we recommend for your needs. Your regular visits with us will take just 10-15 minutes. This is a critical appointment, one which makes the difference in how quickly results are achieved. 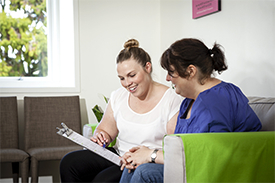 This appointment covers key factors which maximise your results. No adjustment should hurt. Before starting your care plan, we’ll explain exactly what an adjustment will be like and talk you through the entire procedure. You may feel some tenderness if we put pressure on an area that you’re having problems with, but it shouldn’t hurt. Your care with us will be a relaxing experience. Contact us today to start on the road to healthier living (09) 818 8015!